With wildfires becoming an increasingly common environmental issue, more vulnerable people are being exposed to the smoke from these events. How does wildfire smoke affect pregnant women and their unborn children? 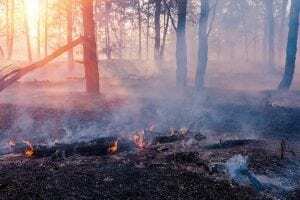 Although there is only a small amount of data on the effects of these natural disasters, recent studies suggest that wildfire smoke can indeed affect pregnancy outcomes. Wildfires can affect not just the landscape, but the people and animals living in these areas. Occupants of the area are often exposed to smoke and ash that decreases air quality, along with high levels of carbon monoxide. In addition, many of these wild areas have been sprayed with herbicides and other chemicals that are released into the air along with the natural byproducts of a large fire. These factors are known to affect health. What is unknown is whether they have a unique impact on the health of a pregnancy. Researchers at UC Davis are planning a long-term study on the effects of this common natural disaster. A grant of $270,000 has been awarded to study the health of pregnant women and their infants after a large wildfire in the area. However, there are other studies looking into this issue as well. Chronic exposure to smoke, such as cigarette smoke, has long been known to affect infant health. Infants who are born to mothers exposed to cigarette smoke have a statistically lower birth weight, which has in turn been linked to a variety of other health problems. Exposure to wildfire smoke appears to have a similar effect on pregnancy. Mothers who lived in Los Angeles and Orange counties during the devastating 2003 fire season in Southern California had infants with a lower average birth weight. This was particularly significant for women who were in the second and third trimesters of gestation during the fire season. While part of this trend could be due to stress, women who lived in areas with high levels of smoke in the air had smaller babies in general. Wildfire smoke is well-known to exacerbate asthma. This can be devastating to all people with respiratory issues but particularly pregnant women. Having uncontrolled asthma during pregnancy puts women at higher risk for high blood pressure and premature delivery. Both of these can have a huge effect on the baby’s lifelong health. In addition to the physical risk, wildfires can pose a psychological risk to pregnant women. Several studies have found that women are at a higher risk of developing postpartum depression after a major disaster in their area. These disasters can often cause a great deal of psychological stress as well as reducing resources. Although this impact on mental health is often ignored in the wake of a natural disaster, it can have a devastating effect on children over the course of their lives. Exposure to wildfire smoke can have serious effects on a pregnant woman and her developing fetus. As a result, the Environmental Protection Agency has deemed pregnant women a high-risk population during times of fire. Women who are near wildfires need to carefully monitor air quality and be prepared to evacuate if they have any respiratory problems. Their health, as well as that of their baby, depends on being in a safe place with plenty of clean air.